Dress up your Plymouth Prowler! These awesome body side flame graphics are designed to fit perfectly on your Prowler's body side panels as shown. Available in a wide variety of colors, this kit is very easy to install and only requires slight trimming at the door jambs. 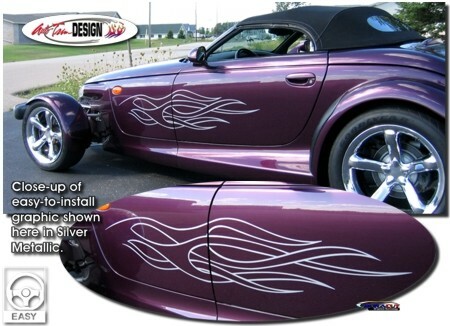 Flame graphics are fit for any '97-'02 Plymouth/Chrysler Prowler. While kit is shown here on a Prowler, it can creatively be used on just about any vehicle.